La Garde-Adhemar is a village along the crest of a hill to the south-west of the Drome department (Rhone-Alps region of France), listed among the 'most beautiful villages of France'. This position also ensures that the view of the village as you approach is very charming. France This Way comment: a small and pedestrianised village, La Garde-Adhemar has a great deal of character and also very attractive views across the surrounding countryside and the Rhone valley, and a visit is very enjoyable. 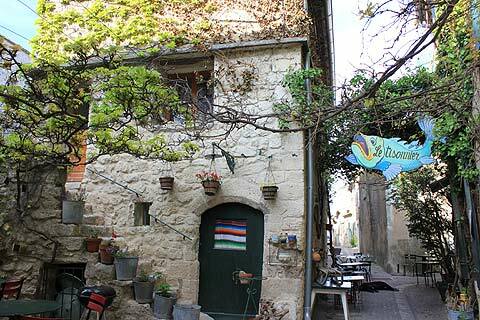 The tourist office for La Garde-Adhemar is on Rue des Arcades in the centre of the village, and can give you a plan and suggested sites of interest: this is very useful, and without it you are likely to overlook certain monuments such as the lavoir and the fountain (to the north-east of the centre, and towards the route leading to the Val des Nymphs). The village still retains a significant part of its original defensive ramparts and two of the original stone gateways through the walls. As you enter the village you will notice a large iron cross - this was erected in the 18th century. 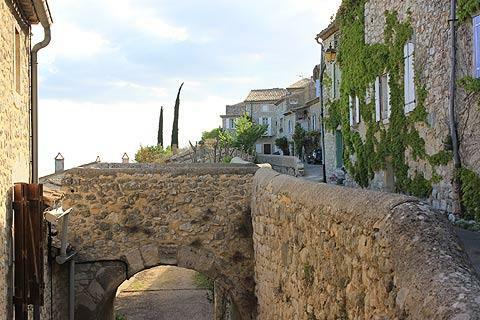 Within La Garde-Adhemar there are numerous small streets and alleys that lead you passed the interesting medieval houses and under the vaulted passages of the village center - this is one of the best preserved medieval villages in the region. 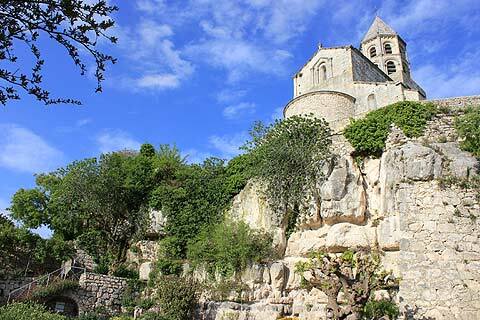 The highlight in the village is the lovely Church of Saint-Michel, built in roman style in the 12th century, with an attractive octagonal bell tower containing double rows or round arches (note that the upper level is a 19th century addition to the church). 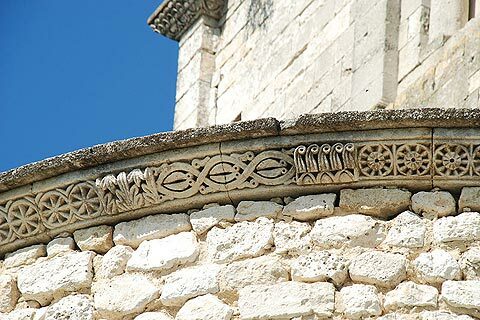 See also the decorative window and round chevet of the church, and the painted wooden statue of the Virgin and child in the church that also dates from the 12th century.. Unusually the church is built using two different techniques, a combination of 'rough' stone walls and 'cut stone' walls. Another unusual feature of the church is the presence of a second apse which is orientated to the west rather than the east which is much more common with churches (the east being the direction of the Holy Land). Another religious monument in La Garde-Adhemar is the Chapel of the Penitents, a simple building from the 17th century with a fresco of two kneeling penitents added in the 18th century inside. The Chateau de l'Escalin has some impressive renaissance windows, and other features from this period can be seen elsewhere in the village. 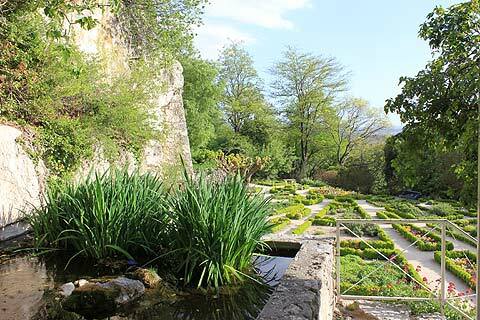 Many towns in France include a 'medieval garden', which are frequently small and uninspiring, but the botanic gardens (le Jardin des Herbes) at La Garde-Adhemar are extensive, with a very large range of medicinal and other plants and the added feature of having far-reaching views across the valley below - they are very attractive and are a highlight of a visit to the village. 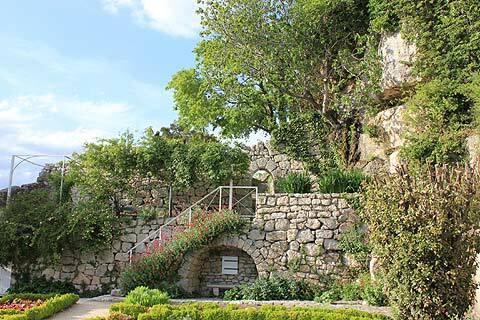 Visits to La Garde-Adhemar should also include a trip along the Valley of the Nymphs to the east of the village - apart from the valley itself there is another very highly regarded example of roman style architecture at the priory of the Valley of the Nymphs. 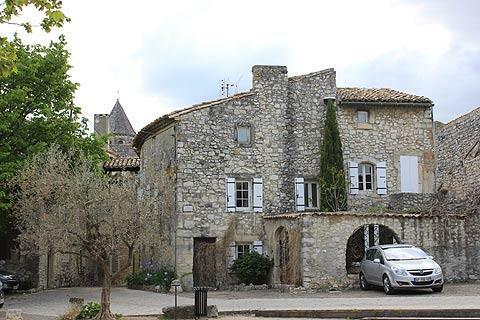 The 11th - 12th century priory is simple in design, with the facade containing a series of three blind arches and a a decorative entrance, while to the rear is a small round chevet. 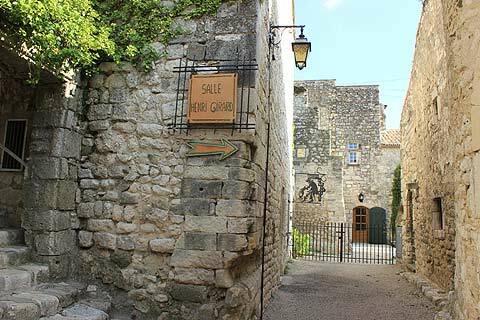 The crocodile farm at nearby Pierralatte is popular with children, while another of the 'most beautiful villages in France' can be visited to the north-east of La Garde-Adhemar at Le Poet-Laval.